What do dancers, plumbers, actors, surfers, and bakers all have in common? They all have hands! Aside from this obvious anatomical common denominator, they all have stories, too, stories those hands can vouch for. Take Dean, an engineer, whose hands—minus one fingertip—recall his teenaged adventures in auto repair. There’s Jane, who wore a single, treasured ring on her left hand, whose unvarnished nails belied a film-star past. 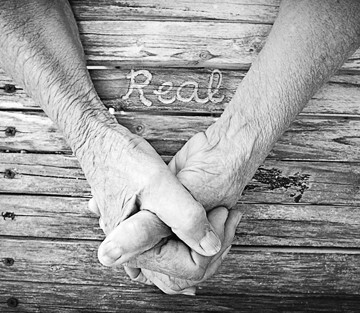 Real, a new book by photographer Terilee Dawn Ouimette and author Shelley Malcolm, illustrates real people’s stories through images of their hands. While describing the trials and successes of their lives, Real gives only first names, providing profiles at once intimate and anonymous. Chet’s gnarled fingers still wrap around a paintbrush, using the limitations of macular degeneration to his benefit as an impressionistic painter. Eve, who paints her remaining fingers a luscious peach, can tell you stories about her girlhood stint as a glider pilot. A dream she had—of a slide show of images of people she admired—provided the template for Real. An easy read at about 150 pages, Real is broken up into 11 chapters, with themes such as “Hope,” “Renewal,” “Work,” “Inspiration,” and “Love.